Robyn Coles Millinery has taken space in Cardiff’s Castle Arcade this month with the opening of the company’s first ever pop-up shop. Open until the 24th December, initially as a trial, the pop-up shop is a great opportunity for people to see how the hats are designed and made, as well as a chance to try on the creations and see a range of fantastic headwear from fascinators to floppy hats, and even bobble hats! We spoke to Robyn about the shop and she told us: “I wanted to offer a very relaxed environment for people to come in, take a look, ask questions and try things on if they want to. I’ve literally brought my studio to the premises and passers by can see me making the hats and the whole process from design to finished product. 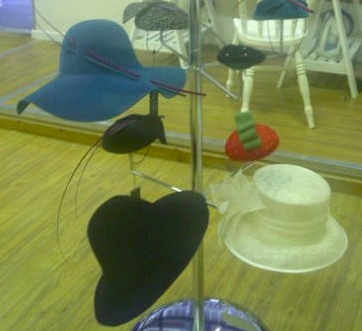 If you fancy taking a look at milliners at work or trying on some of the wonderful creations, pop in before Christmas to 29 Castle Arcade, Cardiff. You can also visit www.robyncoles.co.uk for further information.